One great thing about my living-in-sin-wife/babymama Kari is her exuberance in finding random holidays from various cultures to use as excuses to make a giant spread. Earlier this year, we did an over-the-top Shrove Tuesday pancake feast (cheddar pancakes with pork belly steaks and a cabbage hash) and we were toying with the idea of trying a Passover seder in April (cooler Gentile heads prevailed after seeing just how involved and ritualistic such an undertaking would be). As for Easter, we ate chocolate, naturally. It originated with Mexican-American communities in the American West as a way to commemorate the cause of freedom and democracy during the first years of the American Civil War, and today the date is observed in the United States as a celebration of thanks to Mexico in fending off would-be French support for the Confederate States of America in the Civil War. In the state of Puebla, the date is observed to commemorate the Mexican army's unlikely victory over French forces at the Battle of Puebla on May 5, 1862, under the leadership of General Ignacio Zaragoza Seguín. But, one aspect of the holiday meal surrounding Cinco de Mayo that seems consistent is serving Molé. Molé is a dish that can be found throughout Mexico and everyone has their own version of it. That being said, the Molé we see most in Canada and the US is Molé Poblano, which hails from the same Puebla region from which the holiday likely originates. So, it seems appropriate that I based my Molé recipe on this version, which is the most commonly known outside Mexico. From a few online sources, I got the following unofficial info that Molé a) was put together by a nun who cobbled the whole lot together at the last minute for unexpected guests with whatever she could find (reminds me of the story behind Caesar Salad) and b) it 'traditionally' requires at least 20 ingredients. My version *just* made it to 20 (the cilantro doesn't count), so I guess it was a decent attempt. One of the cooooooooooolest thing about Molé is that it traditionally is all mixed in a mortar and pestle. I looooooooove my mortar and pestle, having acquired it from a local Thai grocer for a mere 25 dollars. It's a huge stone vessel and is a lot of fun to work with, albeit heavy as all git-out. But grinding all kinds of ingredients together with a big heavy stone club brings out my primal cook side, so the whole process of making Molé is a whole lot of fun. - If your Guajillo, Arbol, Pasilla chilies are still a little moist, dry them out/toast them in the oven at 350 degrees Fahrenheit for about 10 minutes. 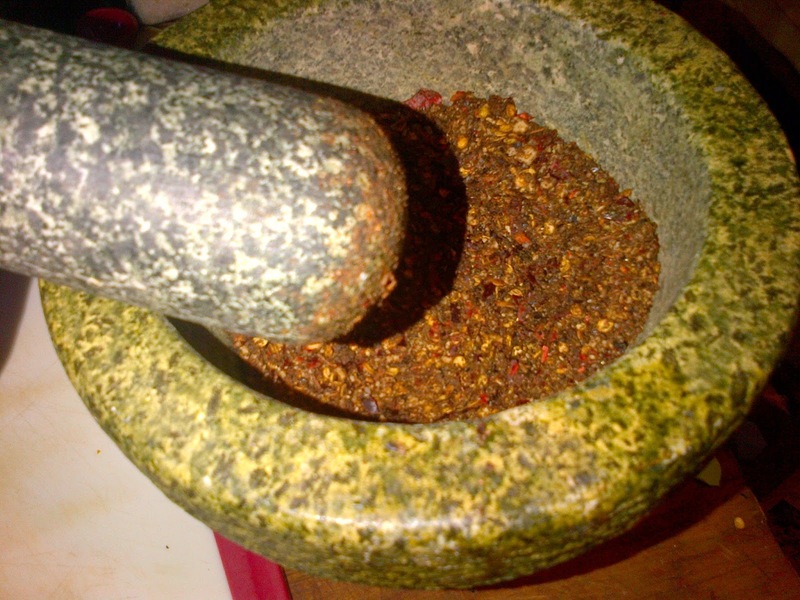 - In a mortar and pestle or spice grinder, grind together the chilies, anatto seeds, oregano, cumin, coriander, peanuts, salt, pepper, cocoa, star anise and cinnamon stick together. It should come together into a kind of semi-moist powder from the oil in the peanuts. NOTE: You can also grind all the other ingredients other than the chicken to make the Molé sauce in the most traditional way possible, but it's a bit messy with all that liquid. - Heat oil over medium-high heat and sauté onions, garlic, chicken and tomatoes for about 5-6 minutes, stirring frequently. - Add seasoning from mortar, stirring to make sure everything gets coated with seasoning. - Stir in tequila and chicken stock and bring to a boil. 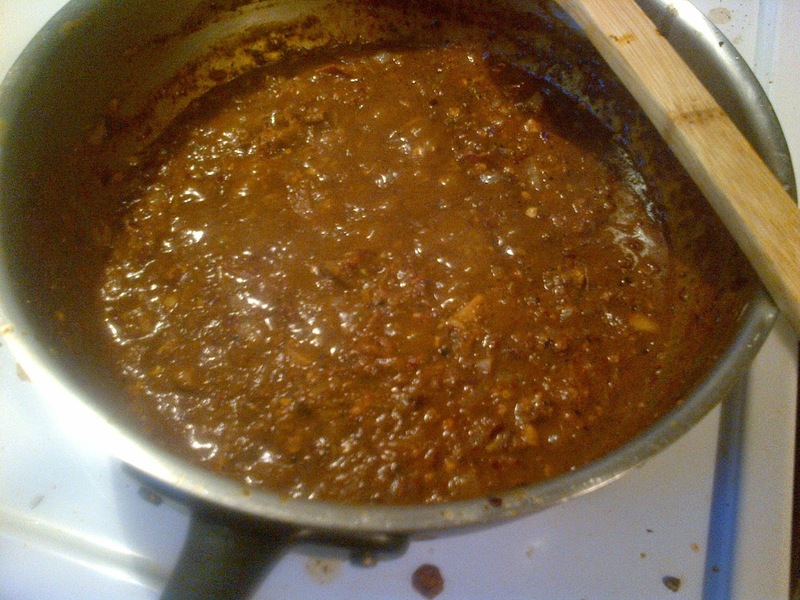 ﻿﻿- Reduce heat to medium-low and simmer Molé for about 20 minutes. - Serve over Mexican Rice (recipe to come) and garnish with cilantro. In the end, I forgot the cilantro (whoops), but the meal was delicious: a good balance of heat, nuttiness, savory and sweet. 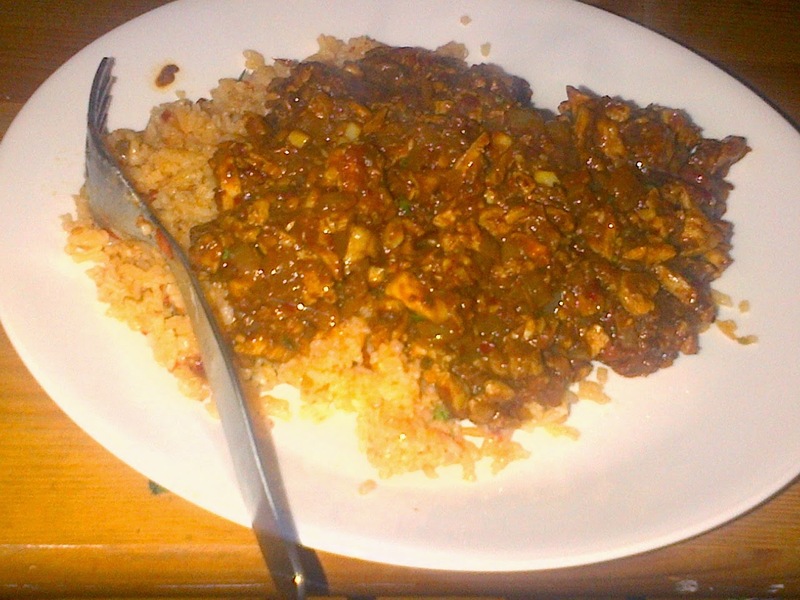 The cinnamon, peanuts and cocoa blended well to create a fairly decent approximation ﻿﻿of the flavour profile of Mexican chocolate and this totally made the chicken excellent, which isn't always easy to pull off . Here's hoping you enjoy this foray into cooking for a holiday! My intention is to make this the first of many! I think it's safe to say that there's no condiment that gets as bad a rap as ketchup, and probably deservedly so. Scourge of foodies everywhere, this ubiquitous saucepaste was pretty much the main condiment the most of us grew up with. 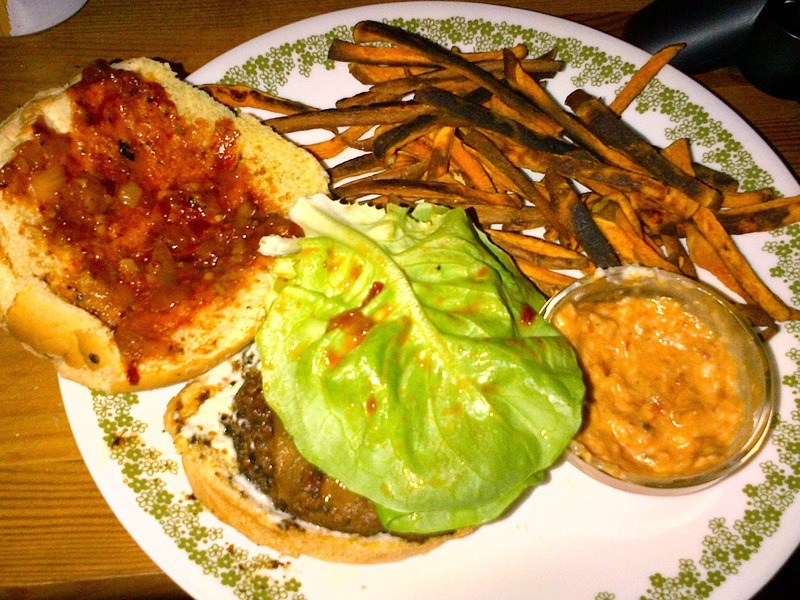 We considered fries useless without it, we drowned our KD in it, and it completed our burgers (well, maybe your burgers, I switched to topping my burgs with BBQ sauce when I was around 8). But as palettes grew up, ketchup became a bit, well, gross. I stopped using it years ago except maybe for fries (when I didn't feel like using Sriracha Mayo) and homemade BBQ sauce, and then only when it's really high quality stuff, like this. As for "57 Flavours", blech. Banana ketchup or banana sauce is a popular Philippine condiment made from mashed banana, sugar, vinegar, and spices. Its natural color is brownish, so it is often dyed red to resemble tomato ketchup. Banana ketchup was made when there was a shortage of tomato ketchup during World War II, due to lack of tomatoes and a comparatively high production of bananas. So, the idea of Banana Ketchup isn't too crazy. I'll admit I don't know what possessed me to whip together, probably something to do with nigh overripe tomatoes and bananas. Either way, it seemed like a good idea at the time. I also thought it would be a good idea to make it a little spicy, hence the use of sambal oelek, which is a chili paste of Indonesian origin. - Heat oil in a saucepan on medium-high and sauté the tomato, onion and garlic. Cook for about 7-8 minutes, until onions are translucent and tomatoes are mushy. - Stir in vinegars, tomato paste, sambal oelek, sugar, molasses, beer and seasonings, mix well and bring to a boil. - Reduce heat to low (1-2) and allow to simmer and thicken for about 20 minutes. - Stir in bananas, Worcestershire sauce and honey and cook for another 5-10 minutes. NOTE: the banana will dissolve quickly if ripe which is why I left it till the end, but if you're stuck with an under-ripe banana, you'll want to start cooking it earlier. - Remove from heat and serve when ketchup has cooled. Refrigerate unused portion in a glass jar. If you want a smooth ketchup, puree in a blender. I prefer a "rustic" style ketchup. Topping for a burger and, mixed with garlic sauce, a great dip for sweet potato fries! So, the recipe I've provided is the "after" version, after discovering that 2 tablespoons of sambal and 2 tablespoons of honey was too much of both, hence why I've adjusted the amounts of each ingredient. But, even a little screwed up, it was delicious! I'm convinced when I make it again to spec, it'll be possibly my new condiment of choice. Decadence! feat. Smoked Mushrooms of Doom! There are many different ways in which one can indulge in all manner of decadent cookery, but certainly one of the most fun is to wrap stuff in bacon. Yes, I know we're all getting sick of the ubiquity of bacon (u-bacon-ty?) in blogs and elsewhere, but that doesn't change the fact that it's one of the foods that makes life worth living, full stop. So, I'm still going to use it and use it ridiculously. Now, for today's post, I can't actually take credit for the idea, that goes to my muse of ridiculous, Kari. In a moment of inspiration, after failing to use mushrooms with a steak dinner the night before and me not being sure what to do with them since I was making ribs and I don't think those two ever go together. Well, unless you stuff 'em with blue cheese and wrap 'em in bacon and throw 'em on the smoker! This was a pretty simple recipe to put together, and it also gave me a chance to test out my new smoker! I've been using the side barrel smoker for years and I've been meaning to expand my arsenal so I can do a whole bunch of stuff at once. - 10-12 large white or cremini mushrooms, stems removed. - Soak a couple of handfuls of wood chips. I used chips that came from whiskey barrels (extra decadence!) but hickory or apple would work. - Stuff mushroom with blue cheese. 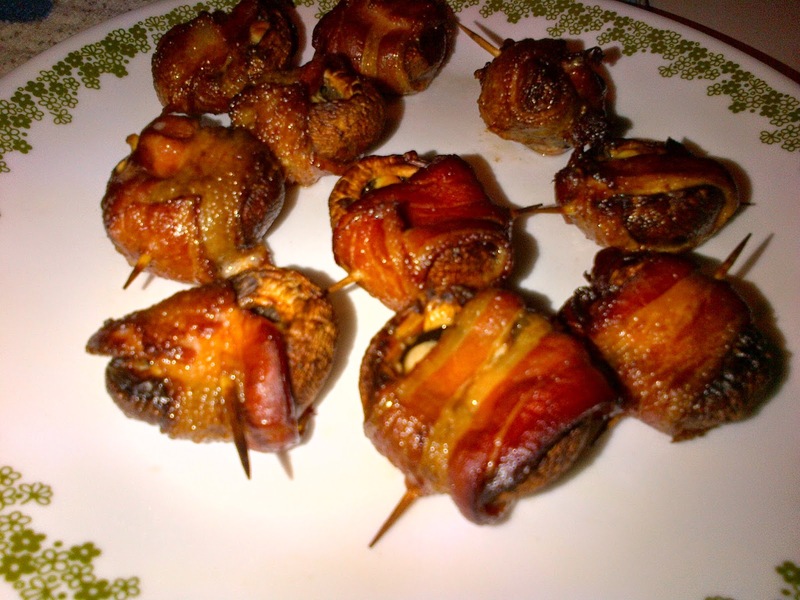 - Wrap mushrooms in bacon and affix with toothpick. - Get the fire going in the smoker. In the vertical smoker, there is a pan at the bottom where you light the fire, and then you stack the other two levels of the smoker on top once it's lit. There's a grill on the next level where you put the food. 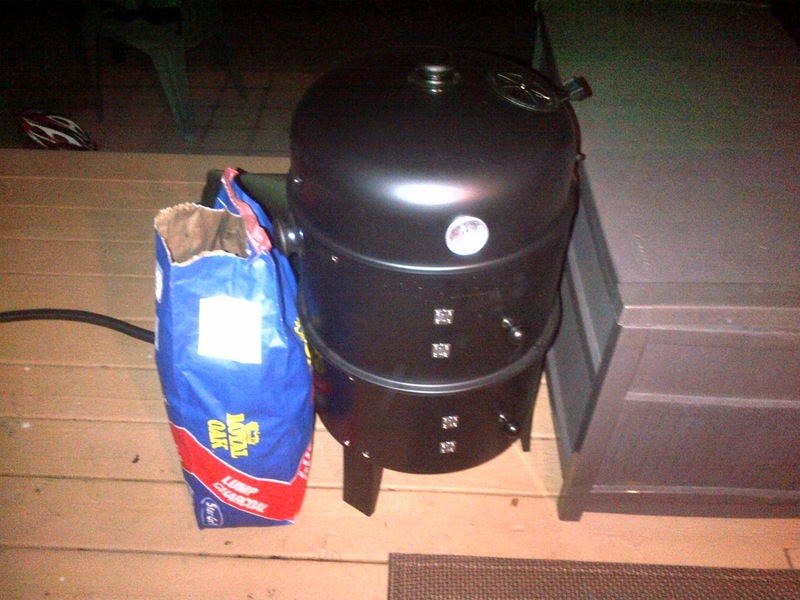 If you get a vertical smoker like this, the instructions should tell you how to do it. - Smoke the mushrooms for at 2.5-3 hours at about 250 degrees. I did them for 2 hours and they were a bit undercooked, so give it some extra time to get the perfect texture. Who needs unclogged arteries? Not me! So, it turned out to be a pretty tasty bite of salty saltiness. The depth of the mushrooms accompanied with the sharpness and creaminess of the cheese was a great pairing, and, well, bacon. The bonus flavour from the whiskey smoke truly set the bar sky-high in the realm of decadence. I think I've found this summer's party treat.